One of the problems these days when you’re looking for subtitles to play with an AVI or DivX video file, is there are so many different releases around and they all have different lengths, different frame rates or encoding/decoding methods which can slightly speed up or slow down the video. When you find a subtitle that appears to be the correct one, it doesn’t quite look right with the text lines not appearing when they should, and coming in too early, too late, or drifting out of sync gradually throughout the video. Free tools are available like SubDownloader, SubiT and Sublite which are great programs to search for subtitle files that will work correctly and sync with your movie file. However, these tools rely on other people to upload and add the records first, then only it will you be shown the search results. Otherwise it’ll say that it cannot find the correct subtitle for the movie. There are times we are not able to find the correct subtitle file that syncs with a movie file from subtitle websites or even using software. When this happens, there are two options. First one is to wait for a few days and hope that the correct subtitle will be uploaded. Another option is to download the subtitle that’s out of sync and synchronize the subtitles with your movie yourself. This isn’t as difficult as it sounds, and we have 6 tools here to easily adjust the SRT or SUB subtitle file to synchronize better with the movie file. 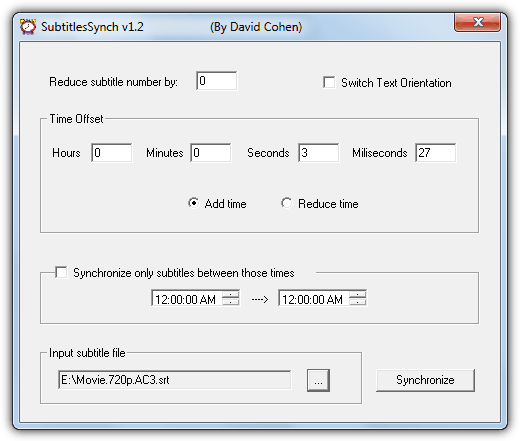 SubtitlesSynch is a small and easy to use tool that enables the user to synchronize the time of a subtitle (.sub/.srt) file by entering the time difference between the video and the subtitle file giving you a new subtitle file synchronized with your video. It automatically open with the previous selected subtitle file and has an option to synchronize only for a specific time slice (good for commercial breaks). The program interface itself is pretty much self explanatory. Load the subtitle file, if the subtitle is slower than the movie character is speaking, then you need to select “Add time” and set the time offset in seconds and milliseconds, minutes and hours probably won’t be required. If the subtitle is too fast, then select “Reduce time” to slow down the subtitle. This is a much more advanced utility and as well as containing several options to repair, synchronize and adjust your subtitle files, Easy Subtitles Synchronizer can also allow inserting and editing of individual lines of subtitle text. This can be achieved with the option to load the video file the subtitle is for so the lines can be checked against the video without leaving the program. Go to File -> Open Subtitle File to load an SRT or SUB file for editing and if the video file has a matching name excluding extension, it can be loaded as well. It can also be loaded manually. Then you have the ability to adjust several timing options from the tabs, including; the time of the first and last subtitles, manual synchronization of specific subtitles, move or change the starting point, extend the full duration and manually or automatically set the frames-per-second for the file. There’s also around 10 fixes that can be applied for common issues. 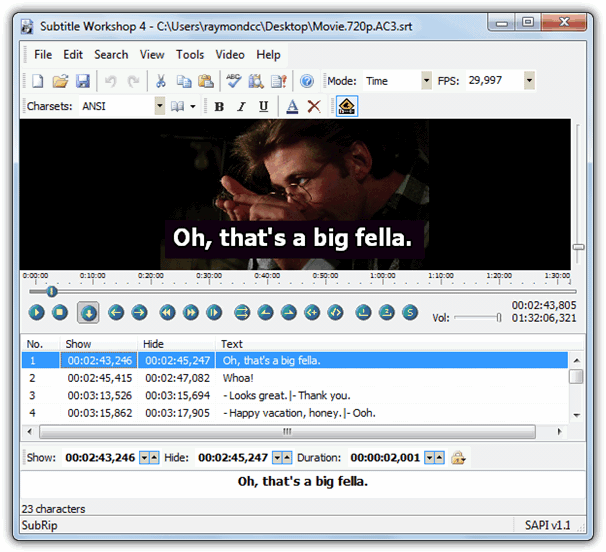 What will make Subtitle Workshop a valuable tool for many users is the sheer amount of subtitle file types it supports, around 30 different formats can be loaded in, edited and saved out again. In addition to editing, there are other powerful options such as spell checking and translating the text between different languages, and a search option which opens a page at opensubtitles.org with the query results. The options to adjust and synchronize the subtitles are found in the the Edit -> Timings menu and there are several to choose from. The simple menu option to shift the subtitles forwards or backwards in time by 100 milliseconds might be all that’s required for some users, although you can also manually or automatically set duration limits, expand or reduce on screen display times, more precise control over inserting positive or negative delay times and adjust the time between the first and last spoken lines. All of those options can be applied to all or just selected subtitles. The video file itself can be opened in the window for a more visual inspection of the accuracy of your adjustments. Some of the alternatives exposed in this article are also interesting for more complex tasks related to subtitles. Thanks for this article! Not free. Free is the point of the article. This article misses BatchSubtitlesConverter from sites.google.com/site/tsdarkness/batchsubtitlesconverter. It allows mass FPS adjustment. It works unlike Subtitle framerate changer which produces junk for some files. Very well explained and useful reply. Thank you! You can use our site subsync.net to sync a bad-synced subtitle in your language based on a good-synced subtitle in ANY language. All you need to do is to find one good-synced subtitle in any language and to go to subsync.net . The service is given absolutely for free. You can also visit subsync.net/about for more information. OMFG where have you been my entire life? Wonderfull solution SubSync! Thank you! subsync.net rulez, can’t believe how simple and fast it was. Definitely the best sollution I’ve seen, no installation needed, perfect! your site was so goods. But your sites can not sync now. Why? If you was good result as before times, I want to use with fees. subsync.net is now for sale and links are paid-for ads. The original subs sync function is no longer available. thank you very much, works like a charm! Great….finally I can use any subtitles i wish…Thanks. VLC, for watching is okay, but not for permanent sub. This is interesting we are right in the middle of a video project.. I use VLC, and the easiest way is to use ctrl+j and ctrl+h to set the subtitles delay in real time. Also, you can use ctrl+k and ctrl+l if the audio is out of sync. Very easy.